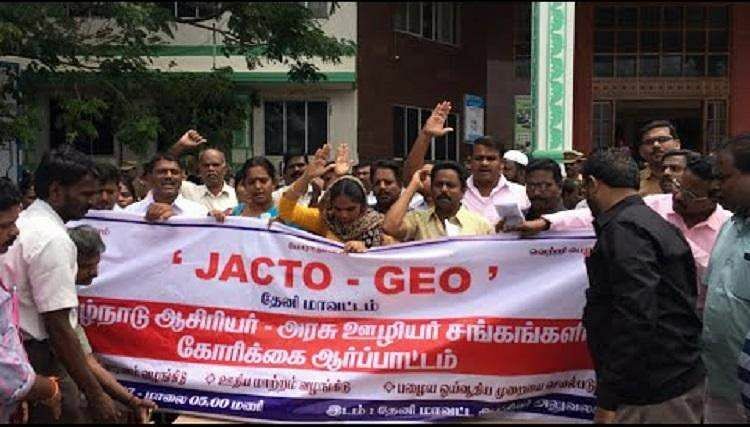 Nearly 97 per cent of the teachers who were involved in the JACTTO-GEO indefinite strike have joined back for duty at their schools in Madurai on Tuesday. Pressing several demands including to implement the old pension scheme, settle arrears of the pay commission, objecting using the surplus teachers elementary school teachers to teach LKG and UKG at anganwadis, the members of JACTTO-GEO announced an indefinite strike from January 22. As the functioning of the schools were affected due to the teachers strike, the government has made an announcement asking the teachers to join for duty back at the schools by Tuesday, else those postings would be declared as vacant and it would be filled up with temporary teachers. Official sources from the School Education Department said that following the announcement of the government, nearly 97 percent of the teachers who were involved in the JACTTO-GEO strike for the past one week have joined for duty at their schools on Tuesday. As the government has extended the time for the teachers to join back for duty till Tuesday evening, the remaining three percent of the teachers are also expected to join back for duty by evening. As the teachers have returned back for duty, all the schools in the district have started to function in the district. While the teachers in the district have joined for the duty, nearly 17 percent of the non-teaching staffs who are working at the schools in the district have taken part in the JACTTO-GEO strike on Tuesday. After one week, 99.5 per cent government and aided school teachers returned to work in Salem also on Tuesday. More than 98 per cent teachers have also returned to their duty in Tirunelveli district, said Chief Education Officer Bala. "The situation is close to normal now. Temporary appointments will be made to fill the vacancies created by teachers who are still protesting or those who have been suspended," Director of School Education Rameswara Murugan said. "Disciplinary action will not be initiated against those who have returned to work. However, those who are yet to return will face action. Positions of teachers who are still in the strike will be treated as vacancies and will be given to teachers seeking a transfer," he said.